Collingwood Coach, Mick Malthouse was tonight announced as the AFLCA’s Etihad Airways Senior Coach of the Year in front of over 500 guests at the AFLCA’s Awards Night at Crown. Voted by his coaching peers, Mick won the AFLCA Award in his 27th year as a Senior Coach. Mick was the AFL’s inaugural Coach of the Year in 1991 and will lead his team into this Saturday’s Grand Final. Collingwood midfielder Dane Swan, won his first AFLCA “Championship Moves Champion Player of the Year Award, breaking the stranglehold of Geelong star Gary Ablett who had won it on the 3 previous occasions. Swan finished in front of Luke Hodge with Joel Selwood in third position. Each Senior Coach voted on a 5,4,3,2,1 basis after each home and away game this Season. Police Minister Bob Cameron made the Presentation to Swan. Ron Barassi was announced as the AFLCA’s second PricewaterhouseCoopers ‘Coaching Legend’ following in the footsteps of John Kennedy Senior who was the inaugural legend in 2009. Barassi received his award from former St Kilda Coach and Kangaroos Premiership player, Stan Alves. The Crown Best Young Player in his first two years of AFL football was star Fremantle midfielder Stephen Hill. 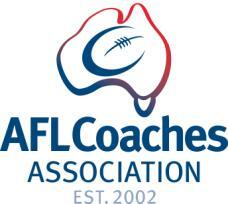 The Coaches’ nominations saw Stephen win from Dayne Beams (Collingwood) and Dan Hannebery (Sydney). Adelaide Coach Neil Craig, presented the Mercedes-Benz Lifetime Achievement Award to long serving Adelaide Football Club Team Manager Barrie Downs. In addition to the 20 years of service to the Crows, Barrie is a life member of Adelaide FC, South Adelaide FC and West Adelaide FC. In total he has completed 56 years of involvement in Club Football. Geelong Senior Coach, Mark Thompson presented the Drake Training/Corporate Traveler Assistant Coach of the Year Award to long serving assistant coach Brendan McCartney. Former Richmond Champion, Dale Weightman presented the Australian Defence Force Support Staff Leadership Award to Richmond bootman Ilmar ‘Drac’ Tiltins.